Custom American Patriotic Gifts Personalized with Full Color Imprint. Promotional, Inexpensive. Budget Prices in the USA. Bulk Patriotic Personalized key tags, patriotic business card magnets, patriotic bag tags and patriotic picture frame magnets allow your client the opportunity to show their pride and still promote their business name or organization's message. Price includes the full color front side graphics shown. Free artwork design. Budget Prices in the USA. American clients pay no taxes. Minimum order quantity - 250. Note: Stock text - "Proud to be an American" - will be added to imprints unless otherwise noted on the purchase order. The patriotic key tags, items P4 and P5 , include a one color backside imprint of your choice (front side imprinting is fixed). This patriotic key tag has a terrific soft touch, a super strong clip and a brilliant imprint that is guaranteed to stay on. Item size: 2.25" x 1.5". 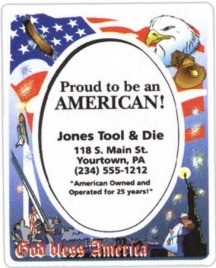 The patriotic business card magnets, items P1 and P2 , include the full color stock graphics shown, as well as your full color custom imprint. The magnet has a free shiny lamination. Item size: 3.5" x 2" (standard business card size). Thickness: 20 mil. The Patriotic luggage tag, item P3 , has a guaranteed permanent imprint and features a complimentary set of write-on panels on the second side. Price also includes a one color, backside ad copy imprint as shown on the product image. This rectangle shape vinyl luggage tag with vinyl strap and write-on backside panel is practically indestructible: it won't scratch, rattle or break. Size: 3.5" x 2". Patriotic imprinted picture frame magnets, item P6 include the full color stock graphics shown as well as a full color, or up to six spot color, ad copy imprint (your custom imprint). Item size: 3" x 3.75", thickness: 30 mil. Unit prices below incluse your custom imprint, as described above. Setup Charge: $40.00 for any item.